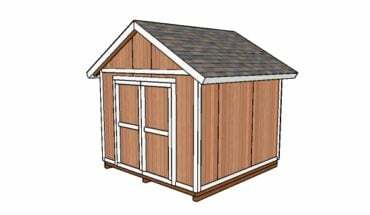 This diy step by step article is about firewood storage shed plans. If you heat your house with firewood, you should also build a small shed to store them during winter and to protect them against rain. Building a firewood storage is a straight forward project, as you need common materials and a few basic woodworking techniques, in order to get the job done in a professional manner. 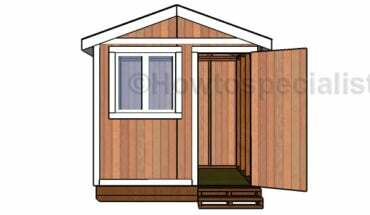 In this article we show you how to build a simple firewood shed with a beautiful design, along with the corespondent plans, tools and materials required to undertake this project by yourself. We recommend you to go to the local building department, as there are cases in which you need several building permits, before starting the project. Therefore, by consulting the local legislation, it will be easier to determine the depth of the footings, the size of the shed or its location. You should remember that our plans are just for informational purpose, as you need to comply with the local building codes. There are many designs and shapes you choose from, when selecting the wood storage shed plans free, that it’s why you should write down on paper from the very beginning, what features and size satisfy your needs, tastes and budget. Having these characteristics in mind, it will be a lot easier to choose the proper plans, even if you are an inexperienced handyman. In this manner you will save time and money, as you won’t be taken aback by anything. 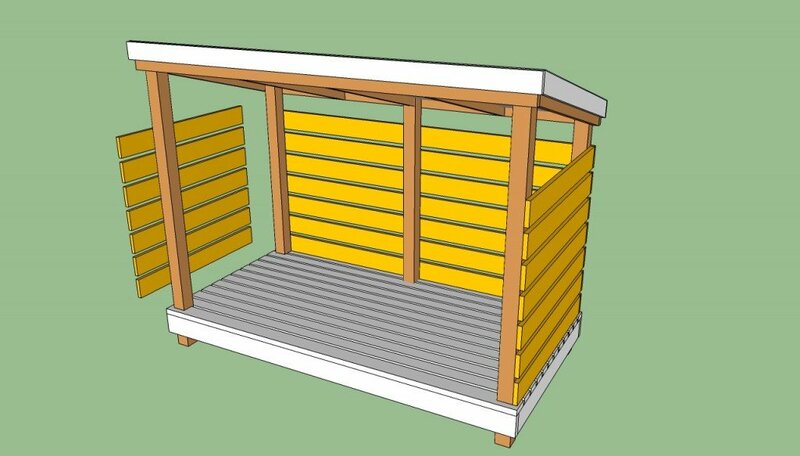 Don’t forget to check out the rest of the shed projects, if you want to see more step by step tutorials. 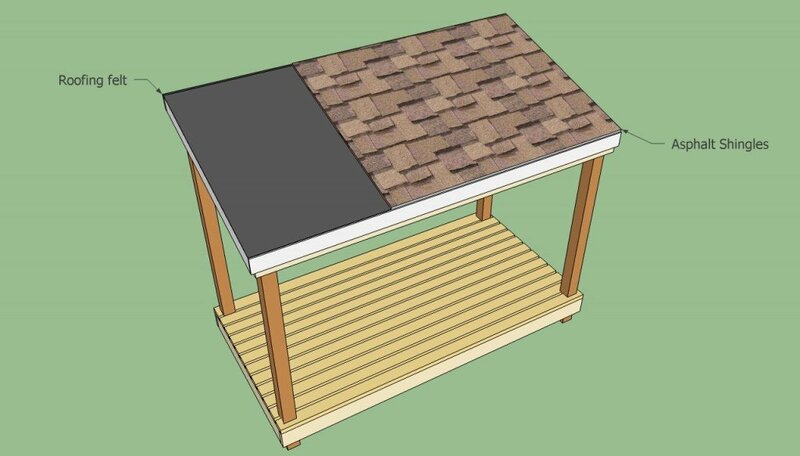 First of all, you have to lay out the firewood shed accurately, therefore we recommend you to use batter boards (made from 2x4s lumber), as in the image. Next, attach string to lay out the perimeter of the shed. Smart tip: Measure the diagonals of the rectangle and adjust the batter boards and the string, until they are equal. You could also apply the 3-4-5 rule on each corner. Dig 1-2′ deep holes with a posthole, making sure they are at least 6” under the frost line. Afterwards, we recommend you to pour a 2” layer of gravel, compact it thoroughly and install tube forms (usually, they have 8” in diameter). Mix concrete and fill the form. Use a level to check if the form is horizontal and install the adjustable anchors, while the concrete is still wet. Use string to align the hardware properly. Installing the posts is a straight forwards process. Therefore, you have to let the concrete dry out for at least 48 hours, before anchoring the 4×4 posts. First of all, you have to cut the posts at the proper size and shape (see the next image). Plumb the posts with a spirit level, secure it with at least two braces and then, insert the lag screws. You could adjust the size of the shed, to fit your needs and tastes. 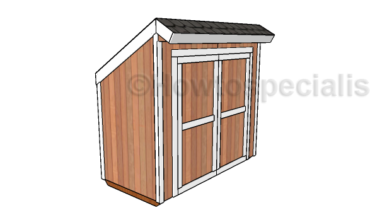 As you can see in the image, in this article we show you how to build a lean to shed, as it is a simple construction and it will keep the costs at a decent level. The slope of the roof should be steeper than 15º, in order to drain the water properly. Use a circular saw to make the cuts, after you have measure the components properly. Sand the edges with a sand blog, to make them smooth. Smart tip: We recommend you to drill pilot holes before inserting the 4” screws, to prevent the wood from splitting. In addition, leave at least 1/2” from the edges of the joists, for the same reason. After you have secured the perimeter beams to the 4×4 wooden posts, you could continue the project by installing the floor joists.Therefore, use 2×6 beam and lock them into position, using joist hangers. The process is straight forward, if you align them properly at both ends and drive in appropriate screws. In most of the case, you should place the joists every 16” OC. Nevertheless, ensure the joists are equally spaced. Next, you should install the 2×4 decking boards, as you see in the image. Taking into account that you will store firewood in the shed, you could save money and materials, if you leave more than 1” between the decking boards. Drill several pilot holes and drive in 2 1/2” screws, after you have aligned the boards. We recommend you to use galvanized or stainless steel screws, as they are resistant to moisture. After you have built the floor of the firewood storage shed plans, you should install the rafters. Therefore, we recommend you to build the rafters from 2×6 beams. As you can see in the image, you have to cut the ends of the rafters at an angle of 15º (or the same as the slope of the roof, if you adjust it to fit your needs). Therefore,m make 15 degree cuts at both ends of the rafters. Place the rafters equally spaced, leaving about 24” OC between the rafters. Insert 4” screws to make a rigid structure, after you have drilled pilot holes. Next, attach the roofing sheets (3/4” tongue and groove plywood) and secure them with 2 1/2” steel wire nails. Drive nails every 6” along the rafters. Align the sheets properly before driving in the screws, otherwise the roof won’t have a neat look. When placing the sheets, make sure they overhang enough to cover the fascias. Use a fine-toothed hand saw to cut the excess plywood, along the rafters. Next, attach roofing felt, as in the image. Make sure you cover the whole surface, including the trims and fascias. Afterwards, install the shingles from the bottom left corner. Make sure the shingles overhang the edge of the roof by at least 1/2, in order to drain water properly. Secure the shingles into place with a nail gun, using 1 1/4 roofing nails. Smart tip: Snap a chalk line at the top of the shingles, to use it as a guideline for the next rows. After you have covered the roof with shingles, you should build the side walls of the construction. Therefore, we recommend you to use 1×6 slats and to secure them into position with 2” screws, at both ends. 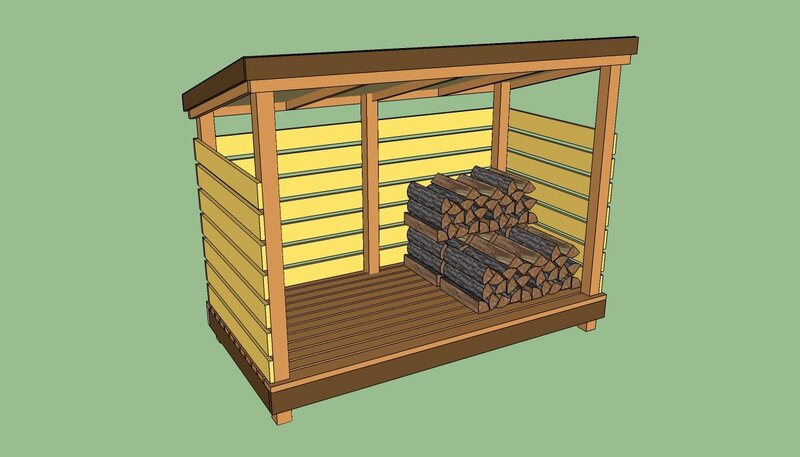 As you can see in the image, you could leave a small gap between the slats (about 1-2”), in order to save material and to dry out the firewood quickly, using the natural airflow. Afterwards, we recommend you to sand the surface with medium-grit sandpaper and to apply several coats of varnish, in order to protect the firewood storage shed plans against wood decay and water damage. Smart tip: If you have followed our step by step instructions, made accurate cuts and aligned the components properly, your shed should be ready to store firewood. 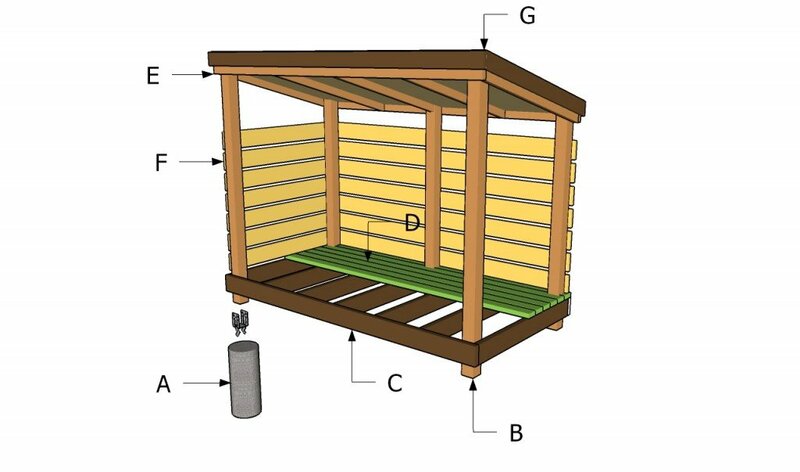 Thank you for reading our article about firewood storage shed plans free and we recommend you to check out the rest of our projects. 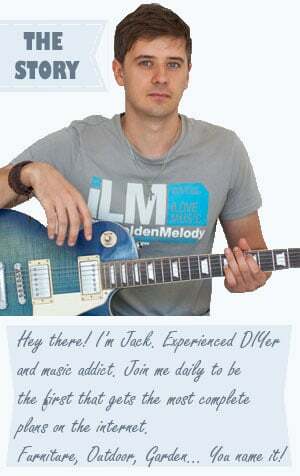 Don’t forget to share our articles with your friends, by using the social media widgets. Hi, I noticed on the 4×8 fire wood shed there is a 4×4 post at the rear center of the shed, nothing is there during the build in any of the plans. But then magically appears in the final picture. Is this a misprint? Hi, should the rafters be cut at a 15 or 30 degree angle? The drawing and the description are conflicting. Thanks. You should make a 15 degree cut (the same as the roof slope). Sorry for the error in the drawing. How long does it take to build as directed?